The US government need not waive its ethanol laws to curb the industry’s call on thinning corn supplies – and politically may be reluctant to as well, despite urges from livestock producers. Groups representing dairy, beef, pork and poultry industries, which compete with biofuel plants for corn, will later on Monday hold a press conference to step up their campaign for a waiver in rules enforcing minimal levels at which the ethanol must be blended into gasoline. However, there is great potential for high corn prices to ration the grain’s use by ethanol plants without political action, Societe Generale said, showing the potential for blenders to turn to elevated US inventories rather than fresh production for supplies. According to official data , US inventories of ethanol are declining, to 19.01m barrels, down more than 2m barrels since mid-June when Midwest drought sent corn prices soaring and affected ethanol production. Ethanol production has fallen below 800,000 barrels a day for the first time since records began two years ago, and down from levels above 900,000 barrels a day in early June. 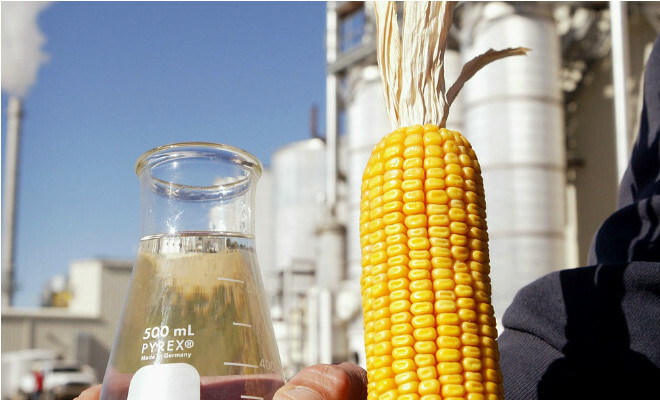 The US could also cut its ethanol exports, with a reduction back to 2010 levels saving some 300m bushels of corn, in terms of the equivalent in production of the biofuel. With information from Agrimoney.